Loughborough History and Heritage Network | Old Rectory Museum Design Project – get involved! Old Rectory Museum Design Project – get involved! The Old Rectory Museum on Loughborough’s Steeple Row is to be used as a stimulus for a design project carried out by students at Loughborough University. Every year, students on the Design School’s ‘Service Design for Social Innovation’ (SDfSI) Master’s course devise solutions for a locally-based, real-world social issue. 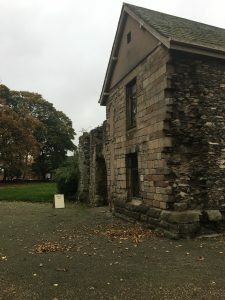 Run by Loughborough Archaeological and Historical Society (LAHS), the Old Rectory Museum has had problems in recent years finding volunteers to staff the building in the summer and in encouraging members of the public to visit it. Supported by their tutors, the students will work in small groups to learn about the issues and challenges faced by the museum and to come up with ideas for helping it continue successfully into the future. Ideas so far include offering an educational programme for local schools and setting up a community garden in the grounds with the support of a local social enterprise company, The Crop Club. The students’ ideas will be hypothetical, with no requirement that they’ll be adopted, but the LAHS are hopeful they’ll secure funding to carry out any that prove feasible. As for the students, they’ll have gained invaluable experience addressing a real-life issue and a qualification in a relatively new area of design. The LAHS are looking for people with an interest in the Old Rectory and its grounds who are willing to help the students with their task. Participants would be expected to attend a number of Wednesday-afternoon meetings at Fearon Hall between 21st February and 31st May to answer students’ questions, share their hopes for the future of the Old Rectory and to evaluate solutions the students come up with. They would also be invited to the event at the end of the project where the design ideas will be shared with the public. Contact Alison on 01509 210767 or by email at oldrectorymuseumloughborough@gmail.com if you would like to be involved.